Las Vegas is well-renowned as a major US city primarily known for its bright lights, glamorous resorts, large casinos, live entertainment, exciting nightlife, expensive shopping and fine dining. The Strip offers plenty of shows and attractions to suit everyone regardless of age. But, a Hoover Dam trip plus taking one of the many Hoover Dam Tours is an essential element to your Las Vegas vacation. The Colorado River is a 1,450m/2,333k water course from Colorado Rocky Mountains to the Gulf of California. The river encompasses parts of seven U.S states and two Mexican states. Since as early as 600 A.D., people have relied on its water for domestic and commercial use. In the 1800s and early 1900s, the Colorado river often flooded in the low-lying farmlands and communities from the spring melting snow. With this on-going problem, a solution was necessary to stabilise the water flow. 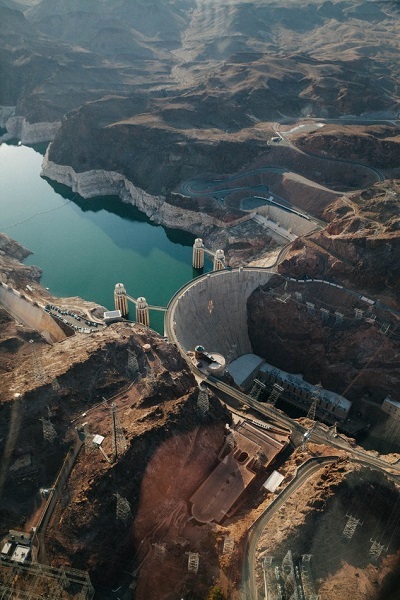 The purpose of a Hoover Dam was to contain the flow of water, minimise the risk of flooding, provide power, water and irrigation for cities and towns plus create recreational areas for communities. Before the river could be managed, a plan was devised to equally divide the water supply between the seven states. In 1922, representatives from each state and the federal government met for this purpose and created the Colorado River Compact. Hoover Dam, once known as Boulder Dam, is a concrete arch-gravity dam in the Black Canyon of the Colorado River, on the border between Arizona and Nevada. The signed agreement divided the Colorado River basin into an upper and a lower half and gave half of the river’s annual estimated flow to each basin. Mexico did not receive a guaranteed apportionment until the execution of the Mexican water treaty in 1944. In 1928, Congress passed the Boulder Canyon Project authorising construction of the Hoover Dam. Construction of the dam began in 1931 and was completed in 1935. The government contractor appointed ‘Six Companies Inc.’ who completed the project, two years ahead of schedule and well under the predicted budget of $48.9m. The dam was built during the Great Depression, attracting thousands of unemployed men and their families, who swarmed into town and the surrounding areas. Many came with their life possessions and little or no money. The infamous community of “Ragtown” on the floor of Black Canyon next to the Colorado River was born. The rough-and-ready shantytown consisted of tents, cardboard boxes, corrugated iron and anything else that could serve as shelter against the scalding heat of summer and freezing nights of winter. Ragtown provided very dismal living conditions. As men flooded the construction site to work or to find jobs, wives and children coped with the harsh comforts of Ragtown. Also called “Hoovervilles,” they were named after Herbert Hoover, who was US President 1928-1932 during the time of the construction of the Hoover Dam. It took 1 year to transform barren desert to a city of 5,000 people. Boulder City had the largest population of any Nevada city. Schools, churches, post office, recreational facilities, and other amenities created a sense of community, absent in many company towns. Those who were hired eventually moved to Boulder City, a community specifically built six miles from the work site to house its employees. Lake Mead is the name of the reservoir at Hoover Dam which receives the majority of its water from snow melt in the Colorado, Wyoming, and Utah Rocky Mountains. 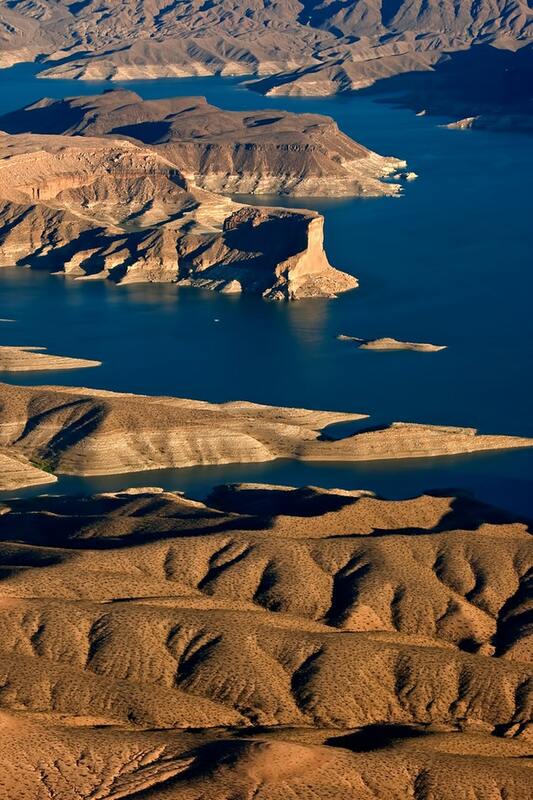 It is the largest (by volume) reservoir in the United States and provides water to the states of Arizona, California, and Nevada. The reservoir provides sustenance to nearly 20M people and irrigation to millions of acres of farmland in America and Mexico. Hoover dam generates over 4 billion kilowatt-hours a year, enough energy to serve 1.3M customers in California, Arizona, and Nevada. The dam can store up to 9.2 trillion gallons of water or two years annual flow. It is a National Historic landmark, a National history civil engineering landmark, and one of America’s seven modern civil engineering wonders. In total 21,000 men worked on the dam with an average of 3,500 – 5,000 per day. The average monthly payroll was $500,000. The “official” number of fatalities involved in building Hoover Dam is 96. However, between 350-500 men also died either in hospital or after they were discharged but since they technically didn’t die on the construction site at the time, they were not included in the “official” number. Some men died from work related illnesses after the dam was completed from conditions such as carbon monoxide poisoning. The Hoover Powerplant has 17 main turbines, 8 on the Nevada wing and 9 on the Arizona wing. Between 1986 and 1993 the original turbines were replaced through an upgrading program. Seasonal flooding of the Colorado River has been eliminated, and today millions of people have fresh drinking water and are able to irrigate during the harsh dry seasons. Thinking about taking a vacation in the United States? Make sure you check out my US Visa Blog for all the necessary visa information. For other U.S. Blogs click here. Viewing this magnificent, manmade dam structure creates a respect for man’s accomplishments. You can’t help but wonder how these men managed to survive building the Hoover dam in such harsh and hot conditions. Hoover Dam in the hottest, driest area of the United States. During the busy summer months, you must pre-book dam tours, weeks and months in advance. A Hoover Dam visit is worth it, regardless of whether you take a tour or not. Hotwire offer great tours and deal. 2. Visiting Hoover Dam – open to the public everyday from 5:00 a.m. to 9:00 p.m. Only bookings required for tours and dam activites. 3. The Hoover Dam Tour Company has a selection of premium tours to the Grand Canyon, Hoover Dam, Lake Mead, and Las Vegas region. Combination tours are available by land, air and river. It’s easy to see why helicopter tours over the dam and Grand Canyon are so popular. The boat cruise down the Colorado River is where you get to take the best instagrammable dam photos and see the magnificent man-made structure from a totally different angle. 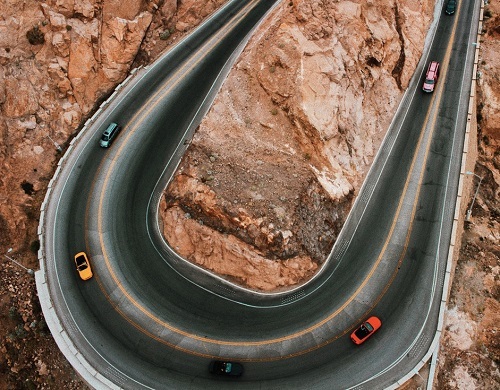 Motor coach trips from Las Vegas to the largest dam built in 1935, fill fast with curious visitors keen to see one of man’s greatest civil engineering accomplishments. Historic photography collection provided by Bureau of Reclamation and the Progressive Traveller. Visitor numbers are limited on dam tours so it is necessary to pre-book your Hoover Dam tours and Hoover Dam bus tours.